While many networks are perfectly fine with splitting their time between scripted and unscripted series to balance off budgets, AMC is going against the grain. The network has announced they’re rededicating themselves to scripted programming and are abandoning almost all of their reality series, both those airing and those in development. It’s like they want to try and recreate The Walking Dead’s massive ratings or something. Speaking of the grim zombie drama, one of the unscripted series that AMC is sticking with is post-game chat show Talking Dead, hosted by Chris Hardwick. The other program not getting the axe is Comic Book Men, in which Kevin Smith and some of his cohorts appraise amazing items from the nerdier sides of pop culture. Both of these shows probably owe their continued existence to The Walking Dead, which serves as their Sunday night lead-in. Three current reality series all bit the bullet. Viewers can no longer look forward to Freakshow, in which former music producer Todd Ray spent two seasons trying to get people to join his Venice Beach exhibit. 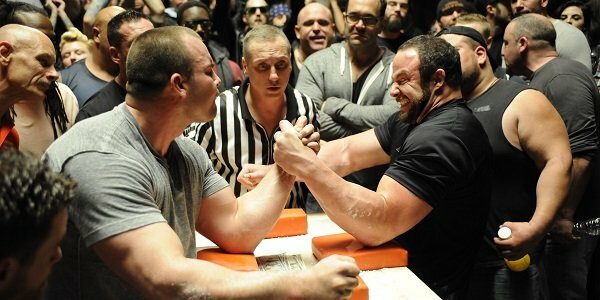 As well, the Georgia-set private security series Small Town Security has been cancelled after three seasons, and the arm wrestling-centered show Game of Arms is no more, despite getting a second season renewal less than a month ago. I’m glad no one volunteered me to be the guy to tell these gents their TV time is up. According to THR, one of the in-development projects that AMC is now passing on is Hardwick’s All-Star Celebrity Bowling, which was to bring his webseries to TV. They’re also not moving forward with a series based on Smith’s Hollywood Babble-On podcast, nor another one they were working on the multi-hyphenate celeb with. Also scrapped: a show about Smashing Pumpkins’ Billy Corgan’s time as the creative director for an independent wrestling league. We’re not shedding any tears over that one. The good news for everyone is AMC is perfectly willing work with other networks on finding these projects a new home. Positions within AMC are expected to be excised as the company focuses its interests on scripted programming. They’ve recently renewed The Walking Dead for a sixth season and are putting that show’s spinoff pilot together. They’ve also got the period drama Turn coming back, along with Hell on Wheels. They’ve got a slew of original series down the pipeline, including the Breaking Bad spinoff Better Call Saul, the sci-fi drama Humans and the martial arts drama Badlands, with pilots for Preacher, White City and more also moving forward. Will you guys miss their reality shows?